One thing I love about being a Brandon Sanderson fan is not only what a prolific author he is, but also his stories are consistently excellent and full of unique and innovative ideas. In addition, he’s a versatile writer, always testing his limits by venturing into different spheres of speculative fiction. Although he is most widely known for his adult epic fantasy, his bibliography includes everything from sci-fi and mystery-thrillers to steampunk, superheroes, and urban fantasy, as well as books for young adults and children. 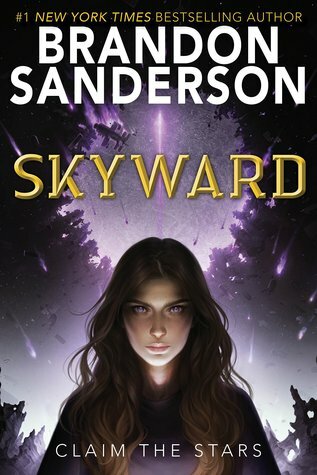 In fact, Skyward is the first of his new YA project, after the conclusion of the Reckoners trilogy with Calamity, and while I know some were a bit bummed this was not the Apocalypse Guard, I think spirits will be lifted again once the sheer awesomeness of this one starts to spread. In a word, Skyward soars. Teenager Spensa has always grown up in her father’s shadow, though in her world, it is not so rare for the descendants of First Citizens families to feel outshined by the heroic achievements of their elders in the Battle of Alta—the battle in which forty pilots for the Defiant Defense Force protected their planet Detritus from the alien Krell attack. Except in Spensa’s case, her father was known as the pilot who ran. Shot down in disgrace for trying to abandon the fight, the stain of his legacy has followed his daughter since. Because in the DDF, there’s nothing worse than being a coward. But becoming a pilot has always been Spensa’s greatest desire. And ever since her father’s death, her determination to fly among the stars has only grown, dreaming of the day she would finally reclaim her family’s honor and prove her father was no coward. All this time, Spensa has held firmly onto the belief that his actions had been a misunderstanding, though unfortunately, Admiral Judy “Ironsides” Ivans doesn’t think so. As the leader of the DDF, Ironsides has final say on whether or not a cadet is admitted to their prestigious Flight School, and she’s bent on keeping Spensa and her “defective coward genes” out. Still, thanks to the growing Krell threat and an unexpected ally in her corner, Spensa may have found a way to achieve her dreams after all. However, even after making it into Flight School, becoming a full-fledged pilot will be an uphill battle, which is true for all cadets, but especially for Spensa who has the deck stacked against her. I confess, YA as a genre has been pretty disappointing to me this year, with so many books I’ve had such high hopes for ending up fizzling out. Nevertheless, I went into Skyward feeling optimistic, mostly because Sanderson rarely lets me down. Like almost everything these days, his stories may build upon the foundation of existing ideas, but I also felt confident that this book would not read like a checklist of YA tropes. Sure, here and there are certain parallels to Ender’s Game, or a nod to the common YA school-setting plot that so often involves competitiveness among the teen characters who are all desperately trying not to wash out. But as always, Sanderson brings his own brand of storytelling and creative concepts to the table, which is why even if you don’t consider yourself a “YA fiction” person, you shouldn’t let the label discourage you from checking this one out. For example, let’s just take a look at Spensa. Our protagonist is brash and hot-headed teen who has learned to protect herself from all the nasty things people say about her dad by putting up a tough front. You start to think to yourself, we’ve seen this all before, because it’s really just the main character’s act to hide her true fears of being a failure and, most of all, the possibility that everyone might be right—maybe her father did lose his nerve and run. Usually this is where the main character (armed with nothing but her tenacity and sass) goes on to emerge triumphant in her quest for the truth, reaffirming her decision to hold the faith while proving once and for all that everyone was wrong to have treated her like an outsider. Yeah, well, I’m not going to say anything more because I’m not about to spoil anything, but things don’t exactly pan out that way. And that’s the thing with Brandon Sanderson books; I always have to brace myself for those “I did not expect that to happen” moments. I also liked what the story had to say about defining yourself and your identity. Admittedly, the messages aren’t subtle, and there’s an all-or-nothing position about a lot of the book’s themes that I think some readers will chafe at. Granted though, while Skyward isn’t exactly as nuanced as Sanderson’s adult novels, I think it explores some rather important coming-of-age lessons, especially those related to self-perception. Cowardice is a prominent theme in the book and is often used as an example to show multiple sides of an argument. Another major point of discussion is predetermination. Of course readers feel indignant on behalf of Spensa, because of how she’s unfairly treated based on theories that she carries a defect in her genetics. But our protagonist also eventually learns that holding onto ideals or dreams that are not entirely your own can just as likely lead you down the wrong path, and from her friends that are AI and human alike, she realizes that letting that happen can be just as bad. All told, there is very little negative I can say about Skyward; this was a book that held my attention riveted from start to finish. Space battles were plentiful and exciting, character development was superb and I loved all of the relationship dynamics, and I also enjoyed the rich and complex worldbuilding—this last one being the trademark of all of Brandon Sanderson’s novels. While some of the final revelations may have come on a bit too hard and too fast, I still found the ending satisfying and some of its implications earthshattering. I hope Sanderson will expand this universe because I’m definitely interested in more. Audiobook Comments: I enjoyed every minute of this ride in audio. Suzy Jackson is the narrator, deftly portraying the bold and loveable Spensa. In addition, she also provides distinctive and memorable voices for the rest of the not inconsiderable cast, impressing me with her huge range of accents and intonations. Just a fantastic listen overall. THis one sort of took me by surprise. Suddenly a new book is out! Haha, Sanderson tends to do that too me too. He’s just so quick and sudden with new releases. I haven’t read anything by the author yet but there might be something lurking on my ereader! Might need to check out the author anyway! Chances are, you might have something by him in your reader! He’s written a ton of stuff! I LOVED Skyward!! I really did appreciate Spensa’s arc and that she wasn’t automatically a brilliant pilot. The info dump at the end was a bit abrupt, but I can let that slide. Great review! Yeah, I don’t know what it is with Sanderson and endings, but he tends to do that a lot (the info-dumping and abruptness)! Really glad you loved this one! Sometimes I think Sanderson really is a machine, he writes so much! Yeah, I actually asked him at Balticon how he does it. People joke that the guy is like a machine and probably doesn’t sleep much, but he did tell me that’s close to the truth, lol! Hah! That’s hilarious. He also just seems like a really swell guy. It’s cool you got to meet him! I loved this one too and can’t wait to read more. I don’t know how he does it to be honest. Sanderson is just in a league of his own! Sounds like Sanderson continues to not disappoint! The whole YA tag to some of his books have always made me hesitant, but then it’s reviews like these that reassure me that there’s no need to fear! 😀 Love the sound of it and would definitely give it a shot if I find myself in front of a copy. Great review as always, Mogsy!